The avialytics InfoBOX is the entry point to flight-related data. With its intuitive, user-friendly web interface, it enables airline companies to get the information about their airline operations in seconds. The avialytics InfoBOX with its underlying Operational Datastore (ODS) collects all necessary data from various sources (e.g. ACARS messages, SITA messages, manual user input). 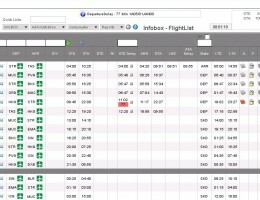 The web interface provides a quick overview about all flights – the scheduled times, actual departure and arrival times, and the state of each flight. Detailed data for each flight, aircraft and airport is only one click away. The program will start by displaying the InfoBOX flightlist. By default, it will display the current day with flights to/from the station of the current user, sorted by STD. The General page contains all scheduled and actual flight data, including local times and possible delay codes. On the Journey Log subpage are detailed data of the flight, like block time, duty time and cycle. There are also information about the crew, jumpseater and fuel data. How the aircraft is loaded is shown on the Load Detail page. A list of the ULDs and their individual weight, as well as a load map for the aircraft, are provided. Comments regarding the individual flights are available and editable over the InfoBOX, too. The received comments are shown in a list and editable by clicking the symbol at the end of each row. Whenever Messages (or raw formats e.g. ACARS, CPM, LDM, APIS, ASM, SITA, METAR, etc. ) are used to provide information in the InfoBOX, the current and historic messages are displayed in this section for reference. Clicking on DocGen gives access to various preformatted and prefilled documents for the individual flights which can be downloaded and used for official purposes. When the availytics’ APIS monitoring and warning tool is used, the APIS state and check result is also accessible within the InfoBOX in addition to the dedicated APIS control workflow. The delays of a flight can also be defined and categorized in the InfoBOX. On the Delay tab the departure and arrival delays are shown. Additionally, the flight- and/or non-flight-related root causes can be defined. If subsequent flights will be affected, they can also be added. Last, there is the possibility to describe up to 4 delay reasons in detail. After each line in the flightlist is a dedicated symbol to insert the requested estimated zero fuel weight (EZFW). It’s an indicator as well as a link to the corresponding subpage which contains an overview of all entries. This subpage also provides the possibility to edit the EZFW of the flight. A small clock symbol behind each line in the flight list indicates commercial delay requests (CDR). On the subpage are all existing requests for that flight as well as their reason, status and history. There is also the option to create a new request which is automatically sent to the OCC and the inserted e-mail address(es). The OCC can approve or reject the request directly in the e-mail, and then the status is shown in the InfoBOX. This delay data is transferred to delay reports which help to identify frequently occurring causes of delay so actions can be taken to reduce them. The Crew Rest data for each flight has a separate tab in the flight details. It contains the resting times of each crew member, including remarks which were provided e.g. via an EFB Solution. The General page provides basic aircraft data such as the aircraft type, max fuel cap and max pay load. The Station-HIL page contains the last updated Hold Item List (HIL). It lists all aircraft-related maintenance tasks to be done in a certain amount of time/flight hours/flight cycles. The TechOps-HIL is similar to the Station-HIL report with additional information. On the General tab, basic airport information such as name, GMT offset, opening hours, and boarding time in minutes are shown. Another tab shows the AirportMap. On the CityPair page, all available departure and arrival airport combinations for this airport are listed, with detailed information like distance, ocean crossing, etc. On DST, the time zone, UTC offset, beginning and ending UTC data is listed for the particular airport. The Documents page provides all airport-related information documents, such as AirportMap, Arr/Dep airport information. There is also a Catering Report page which gives access to the needed catering data of each aircraft at the actual airport on a selected day. Additionally, the number of sleeping kits is calculated. A list of all catered flights is displayed on the Catered Rotation tab. The list can be filtered for a selected timeframe, limited to the flights catered by this station and limited to flights with no catering station assigned. To manually adjust the catering for a particular flight, edit the catering data through the Edit Catered Rotation dialog box.